A brutal crackdown seems to have taken place in Pakistan's disturbed border province of Balochistan after the Indian Prime Minister Narendra Modi highlighted the human rights violations there in his August 15 Independence Day address. The toll of dead and missing people has witnessed a sharp surge, with at least 67 dead and over 150 reported missing in August alone, local activists and multiple well-informed sources with access to inside information have averred. According to these sources, the latest death was of 10-year-old Sudees of Khuzdar tehsil on August 30. Earlier, a youth named Amaan from the Mand area of Kech district, was shot on August 28 in a Pakistan Army offensive. Fifteen bodies, some mutilated beyond recognition, were recovered over the August 27-28 weekend from different areas of Dera Bugti. "We had documented total 66 extra judicial killings as of Sunday (August 28) evening. Forces buried bodies of three civilians in Sui region on Sunday night. Twelve more bodies were buried without any last rites by Pakistani forces in Anayat Shah Darbar area of Dera Bugti a night before. The bodies were later recovered by locals," Zamuran Baloch, a journalist-activist working underground and a member of the banned Balochistan Journalist Forum (BJF), told IANS. Adding that none of the deaths or abductions were reported by a widely censored Pakistani media, he said dozens, including Aslam Majeed, a student from Atta Shad College in Turbat city of Kech district, were taken away by Frontier Corps (FC) of the Pakistan Army on Saturday. "Frontier Corps generally abducts people while the Death Squad, a religious militia that has the army's support, often kills people in full public view," Hafsa Baloch, another BJF activist, told IANS. The figures of dead, however, varied among activists. Some who did not want to be named claimed the toll to be around 60 and others put it at more than 65 so far in the month they called, bloody August. Activists and journalists in Balochistan recorded over 20 deaths in July and 32 in May. There was no way of independently verifying these figures, but activists are ready to give names and full details of the dead and missing persons. "These numbers are not accurate, there must be more. We don't know exactly how many had died or were taken away from New Kahan, a small town of Marri tribe situated about 15 km from Quetta (the provincial capital). The place is often referred as the 'Gaza Strip' by Baloch people," Zamuran said. According to the US-based activists from the international arm of the Voice for Baloch Missing Persons (VBMP), more than 25 mutilated bodies had been recovered in August. "But if we include people ambushed or killed in battle, then it could be much more," Farzana Majeed, General Secretary of international VBMP who was given asylum by the US in December 2015, told IANS. Sources in Baloch Republican Party had identified about 26 victims in Dera Bugti district alone before August 19. Activists from the Free Balochistan Movement also believe that the figure could be around 60 or more. Meanwhile, the crackdown on influential Bugti tribal leaders had also intensified since August 27. "Two elders of Bugti tribes from Sui, Wadera Elahi Baksh Bugti and Wadera Mohammad Baksh Mondrani Bugti, have been abducted by FC," Hafsa Baloch said. Activists on the ground said that over 20 mutilated bodies of previously missing Baloch, including women and children, were found dumped by the roadside between August 14 and 20. Mutilated bodies of three men with missing organs were recovered by locals from Lasbela district on August 24. "They were Razaq Marri, Sharif Baloch and Karam Khan. I knew Razaq personally, he was bold and would debate over the human rights situation here with anyone. All three bodies had their organs missing," Zamuran said. 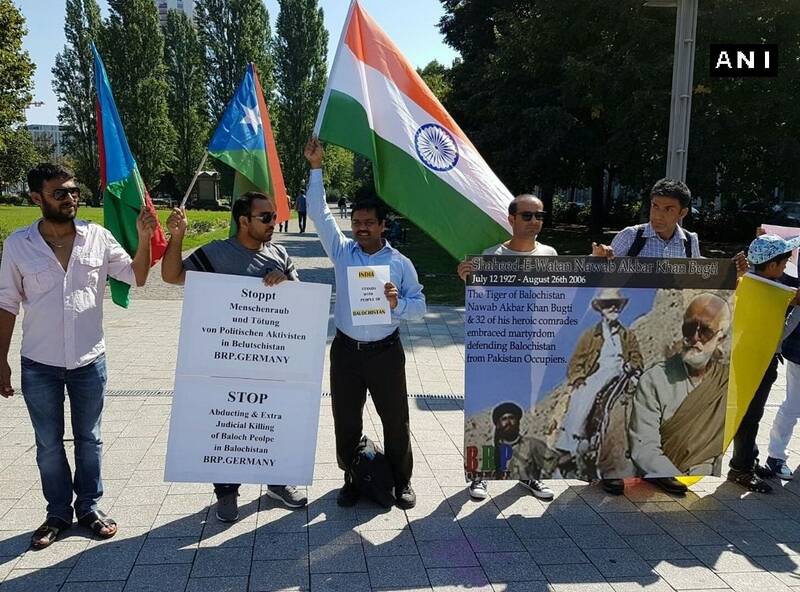 Zamuran, who like many others activists and journalists had adopted a 'pen-name', speaks of a complete blackout on the media in Balochistan following the recovery of the mutilated body of Baloch journalist Haji Razzak from Karachi on August 24, 2014. Razzak, a sub-editor of the now shut Baloch newspaper Daily Tawar, was abducted in March 2013. About 33 Baloch journalists, including Irshad Mastoi, Hameed Baloch, Manzur Bugti, to name a few, have been killed in Balochistan in recent years. "To do journalism or activism in Balochistan is to invite death. Most of us had either gone underground, left the country or died," Zamuran said. He added that while August has always been macabre for Balochistan, this August is severe due to intensified anti-Pakistan protests with Indian flags. "We mark our independence on August 11 and Pakistan on August 14, which is opposed by Baloch. This year, on the Indian Independence Day, Prime Minister Modi's call on human right situation has given courage to people, so Pakistan is more aggressive," UK-based Baloch activist Faiz Muhammad Marri told IANS. Sources in Balochistan said that on August 11 Pakistani forces rounded up around 2,000 people from Quetta and Mastung while about 40 Marri Baloch were picked up from New Kahan, Quetta. He added that a crackdown also followed the August 8 attack on a Civil Hospital in Quetta. Hafsa also speaks of targeting of "intellectuals", saying that on August 7, Baloch poet Mumtaz Arman was arrested at gunpoint near Madarsa Shamshulmaloom in Kharan district. "Several intellectuals had been killed or abducted for last few months. Mannan Baloch, a doctor and secretary general of BNM, was killed along with his son, while a scientist, Zakir Majeed Baloch, a school teacher Nawaz Baloch and a human rights activist and publisher Wahid Baloch have been missing," Zamuran said. "Bodies are recovered in different ways. They are dumped by the roadside, along the coastline, sometimes they are dropped from helicopters and sometime a mass grave is discovered," said one activist who did not want to be named. He recalls one incident where bodies of four missing Baloch activists — Fida Baloch of Mashky, Adil Baloch of Khuzdar, Qayum Baloch of Quetta and Muhim Baloch of Turbat — were dropped over Gujar village in Awaran district from a helicopter on November 20 last year.